I'm trying to setup imperihome but am running into a problem where only some devices show up. I also set it up on my wife's phone (Both latest IOS version) and on her phone she gets different devices then I do (some overlap too). I've tried rebuilding the cache, reinstalling imperihome, etc but can't get the devices to change on either phone. It seems to work otherwise though since I can click on the devices that do show up and manipulate them (i.e. turn lights on or off). I'm not really sure how to troubleshoot this. Any ideas? that's very strange that you get different results on different phones. What kind of devices are missing? Could you set the log level to Trace, and check the logs to make sure all devices are sent to the iOS app. the devices missing include quite a few light switches and some events. It almost seems like it reflects what devices the system had when i first installed the plugin and imperihome on my ios device but then didn't pick up subsequently added devices/events. Looking at HS3 log with impherihome plugin set to trace is this the section that I should be looking at? 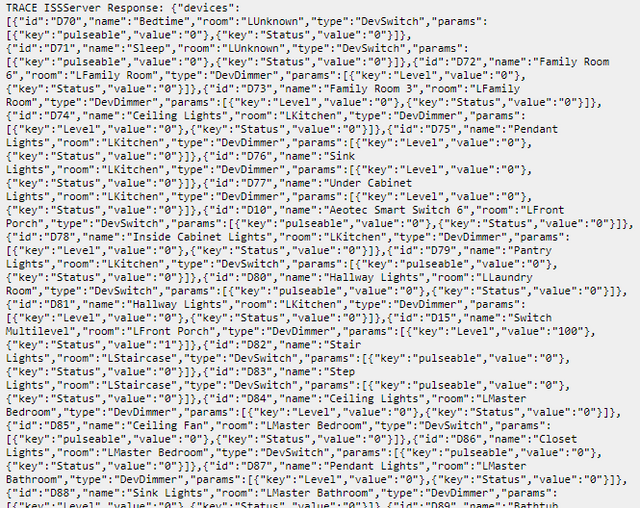 I used a JSON to csv viewer to look at this output and it looks like all my devices are listed so if i'm looking in the right place it seems to check out..
which i'm assuming is this light switch? It almost seems like it reflects what devices the system had when i first installed the plugin and imperihome on my ios device but then didn't pick up subsequently added devices/events. ah @%#&.. lol. I'm an idiot.